Fort Monmouth’s history can be traced back to the establishment of the Signal Corps training facility in Little Silver in 1917. The installation gained permanent status in 1925, and was named Fort Monmouth in honor of the soldiers of the American Revolution who died in the battle of Monmouth Court House. 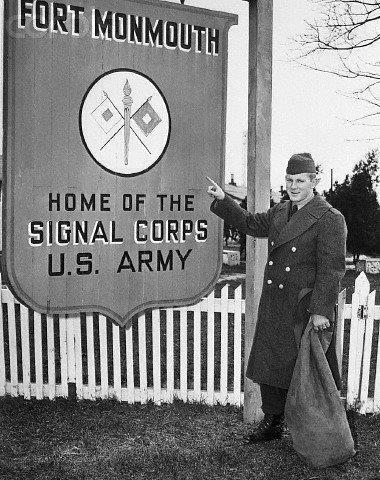 Fort Monmouth served as the home of the Signal Corps Laboratories and later the Signal Corps Center, consolidating several Signal Corps functions at Fort Monmouth. The Electronics Command (ECOM) was established at Fort Monmouth in 1962 and managed signal research, development and logistics support. ECOM was later fragmented into three Commands and one Activity at Fort Monmouth, until being combined as the new Communications-Electronics Command (CECOM), effective May 1, 1981. In 1993, the Base Realignment and Closure (BRAC) Commission mandated the closing of the Evans Area, Vint Hill Farms Station, and the Command Office Building in Tinton Falls. In 1995, BRAC ordered the relocation of the avionics logistics support mission from St. Louis to Fort Monmouth. In 2005, BRAC ordered the closure of Fort Monmouth and the relocation of CECOM to Aberdeen Proving Ground (APG), Maryland. The CECOM flag was cased at Fort Monmouth on September 10, 2010, and the colors were uncased on October 22, 2010, marking CECOM’s official arrival at APG. The forerunner of the Army Air Corps and the U.S. Air Force had its roots at Fort Monmouth. In 1928, the first radio-equipped meteorological balloon soared into the upper reaches of the atmosphere, a forerunner of a weather sounding technique universally used today. In 1938, the first U.S. aircraft detection radar was developed here. In 1946, space communications was proved feasible when the Diana Radar was used to bounce electronic signals off the moon. The Army’s homing pigeon service, headquartered at Fort Monmouth since the end of WWII, was discontinued in 1957 due to advances in communication systems. Many courier pigeons were sold at auction, while “hero” pigeons with distinguished service records were donated to zoos. The information above, as well as more detailed information, is available from CECOM’s Historical Office website.